Production Expert | New EVE SC207 Monitors After Twenty Years - Why Did I Wait So Long? New EVE SC207 Monitors After Twenty Years - Why Did I Wait So Long? Why do we want great studio monitors? That is not an obvious question to answer. On one hand, we want some degree of gratification as we are working on our music. In other words, we want it to sound good. But we also want to make sure we are mixing our music properly so that it will sound great wherever it is listened to. I am going to suggest a third facet. The better our studio monitors are, the more we take them for granted. And that is a good thing! The main thing I want from my monitors is to not think about them. I mean like ever. At least, after they are set up and I get used to them. I want to focus on the music and not have to think about the monitors. The longer one uses the same monitors and gets to “know” them, the more invisible they become. I have not had to think about my monitors in twenty years. In 1998 I bought easily the most expensive piece of gear in my then brand new home studio. A pair of Mackie HR824 powered monitors. State of the art back then, at least in their price range. A few months ago, I had to start thinking about them. Like a trusted old friend, you overlook some of their idiosyncrasies. One of the woofer dust caps got pushed in years ago during an overly aggressive cleaning. Later, intermittent crackling began, likely due to some deteriorating interior wiring or connections. But I persevered until the power supply finally cut out. I can’t really complain about a solid twenty year run with them. What now? Sure I had heard of the new brand names but was unfamiliar with all the new models, features, and technologies. Enter Eve Audio. I know the Canadian distributor, and, after assessing the size of my studio, they offered to loan me a pair of Eve SC 207 speakers to try out. Well, they haven’t got them back yet. From the first note of music after powering them up, one thought occurred to me. I had held on to my old Mackie monitors way too long. I started by listening to some of my recent mixes. They sounded fantastic. I heard detail I hadn’t heard on my old woofer worn Mackie’s. It’s not as specific as saying the low mids were less muddy, or there was more clarity in the high range. They just sounded good! I was sold, but figured I better do my due diligence before I wrote him a check; especially if I want these to last another twenty years! So I started researching them, to not only figure out why they sound so good but also to make sure these are in fact what I needed. I was used to 2-way monitors and didn’t see any need to change, particularly for the size of my studio. I was used to the slightly bigger woofer in the Mackie’s but these 7” (6.5 technically) woofers packed way more bottom end. I definitely did not need the step up to the SC 208 models. So, why do these woofers sound so good? Eve uses a copper cap magnet system on these SilverCone woofers. They help the driver system maintain a symmetrical magnetic field for the voice coil. In layman’s terms, that means very low harmonic distortion and higher overall transparency even at higher sound pressure levels. We keep hearing from plug-in developers about the pleasing aspects of introducing harmonic distortion. In fact, we often buy plug-ins specifically for this purpose. But this is exactly what you do not want from the speaker playing back the audio! We need them to be neutral, not add anymore harmonic distortion if possible. Eve Audio also uses a unique tuned, larger than normal, rear rectangular bass port design with no hard edges. This adds to their efficiency in the low frequencies, by avoiding port distortion. These speakers use a Class D PWM amplifier with protection limiting. In order to torture test them, I cranked the input. And sure enough, the limiter eventually kicked in, as expected. I don’t plan on doing that again, but am glad to know that feature is there for the one or two times in the next twenty years it may happen by accident. The short term output power is 100w, more than enough for my needs. The maximum output level is 106 dB (SPL @ 1m). The big sound of these speakers though is also due in part to it’s proprietary Air Motion Transfer (AMT) RS2 ribbon tweeter design. The bigger magnet inside is what makes the magic happen. The onboard DSP (using an onboard 24 bit/192kHz Burr-Brown A/D converter) is also very sophisticated and helps the speakers work optimally in your physical environment. Eve Audio uses a unique push knob on the front to control not only volume but several different filter settings. Pressing and holding the control for three seconds puts the monitor in standby mode. The volume decreases gradually while the LED ring lights up once around the volume control. The LED on the right end will then light dimly and the power consumption is reduced to 1 watt. Another short press exits standby mode. Pressing the control once enters the Settings menu where you can set three different filters (Low, Desk, and High), as well as the LED ring’s behavior. The Low-Shelf Filter allows you to boost or attenuate frequencies below 300 Hz in 0.5dB steps. 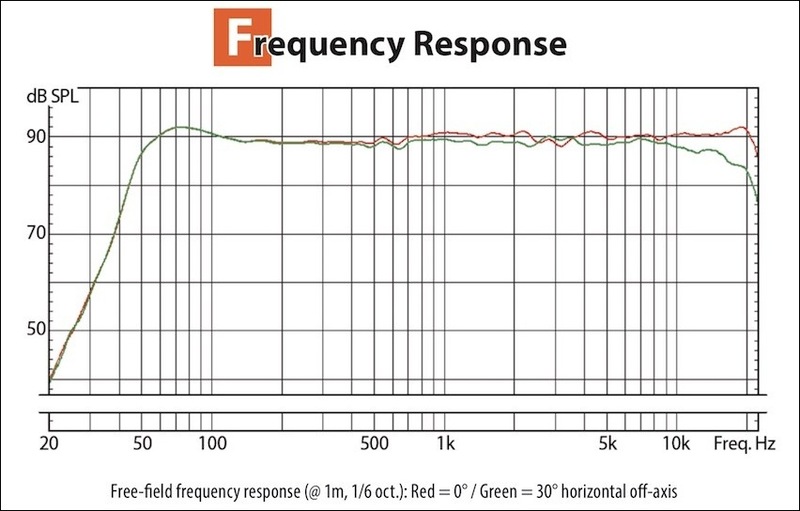 The High-Shelf Filter allows you to boost or attenuate frequencies above 3 kHz in 0.5dB steps. The Desk Filter has two functions. When turned down it acts as a narrow- band EQ set to 170 Hz. When turned up, the Desk Filter also works as an EQ but this time set to 80 Hz. This allows you to give more punch to the lower frequencies. The rear panel of the speakers has three dip switches, in order to lock in the volume and filter settings and prevent them from being changed accidentally. There is a main voltage selector on the rear as well, so these speakers are easily switchable between North American and European voltage. Connections are made either via a balanced male XLR or RCA cables. A word of warning from personal experience: I ordered some inexpensive balanced male quarter inch to make XLR cables to connect them to my Apollo 8P audio interface. I experienced intermittent dips in volume on one of the speakers, despite nothing being changed in the settings. It took me a while to suss out that it was the cheaply made cables. If one of the two signal wires in the cable is interrupted, the lines become unbalanced and lose 6db. So, buy good cables! So, will these speakers last me twenty years? Of course, there’s no way to predict this, but I can say that my relationship to my new EVE SC207 monitors is off to a rock solid start. So far I have my filter settings all at their neutral defaults. I do plan to experiment with them slowly, as well as some sound treatment to my room. If I come up with interesting and useful results, I’ll be sure to let you know. HEDD Tower Mains - Combining The Best Of Nearfield and Mains Monitors. Why Build Them As Sealed Boxes? Are The New HEDD Tower Mains The Best Behaved Main Monitors You'll Hear?